ick, originally uploaded by Seligmans Dog. It's cold and, aside from a pork shoulder I'm starting tomorrow morning, I'm just making pedestrian fare these cold, dark days. Not all boring though. Got a couple bagels this morning. All ready to cheese 'em and checked the state of the cream cheese in the back of the fridge. Wow! I think I'll call Merck and see if they want to send out some basic research folk to get a sample of this to see if there's any promising drug candidates lurking in this rich pot of biodiversity. Thankfully, we had more cream cheese. This was cool though. Wow, I'm surprised. I thought this was within your tolerance level for consumption. Yay! 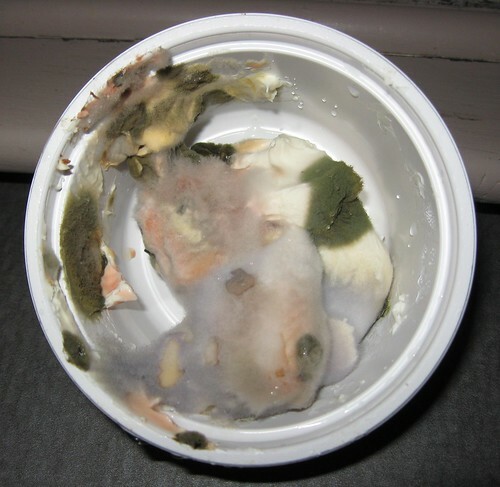 I love mold pictures! You're probably the sort who could identify those molds. looks might there might be a few varieties going on there!